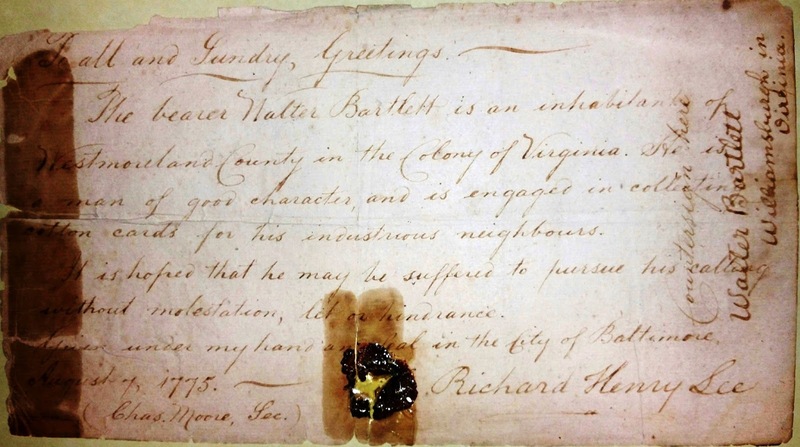 To all and Sundry Greetings ---- The bearer Walter Bartlett is an inhabitant of Westmoreland County in the Colony of Virginia. He is a man of good character and is engaged in collecting cotton cards  for his industrious neighbors. The document, which has a period red seal, is countersigned: “Walter Bartlett, Williamsburgh in Virginia.” The hope that he could "pursue his calling without molestation, let, or hindrance" was intended as a type of pass because strangers in the area, like Bartlett, would have been suspected as a Tory Spy. Subject: RE: Richard Henry Lee DocumentSent: Tuesday, August 16, 2016 1:51 PMTo: SYKSubject: RE: Richard Henry Lee Document We have a similar document in our collection, identifying another collector of cotton cards (some people refer to them as carders—they have fine teeth for combing the cotton to make it into a roll ready for spinning). Ours is signed by Richard Henry Lee and Samuel Adams. 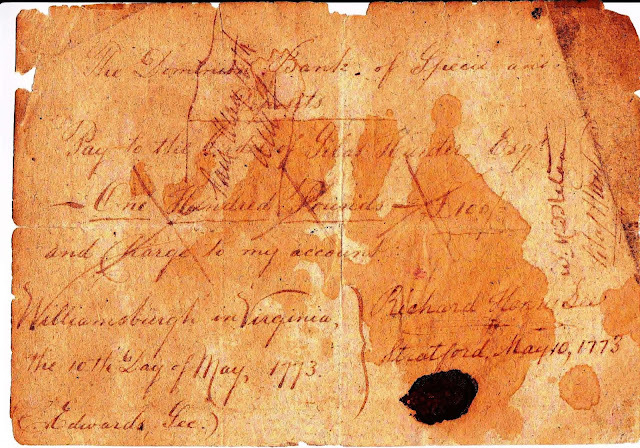 I believe that , while your document was written by a secretary, Richard Henry Lee’s signature on it is authentic. It is identical to his signatures on other documents in our collection. It’s just a coincidence that his signature is similar to the secretary’s writing. 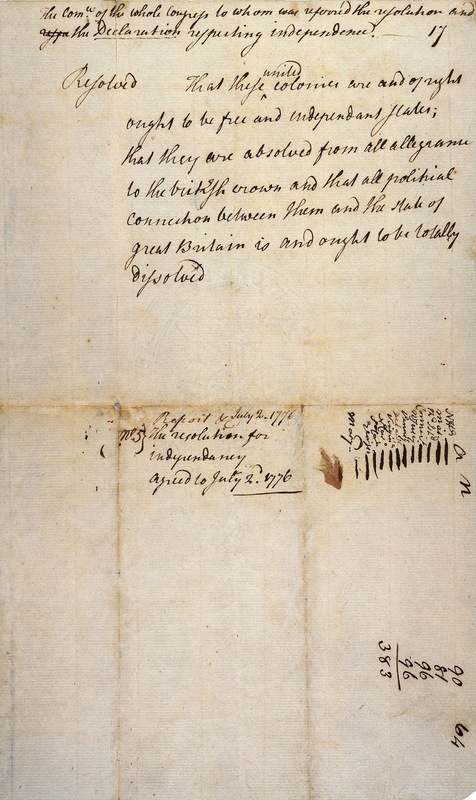 Richard Henry Lee signed our document as well. Actually, I’m attaching a scan of our document since it appears that the same person wrote both documents. Richard Henry Lee (January 20, 1732 – June 19, 1794) was an American statesman from Virginia best known for the his "Resolution for Independency," of June 1776 calling for the colonies' independence from Great Britain. 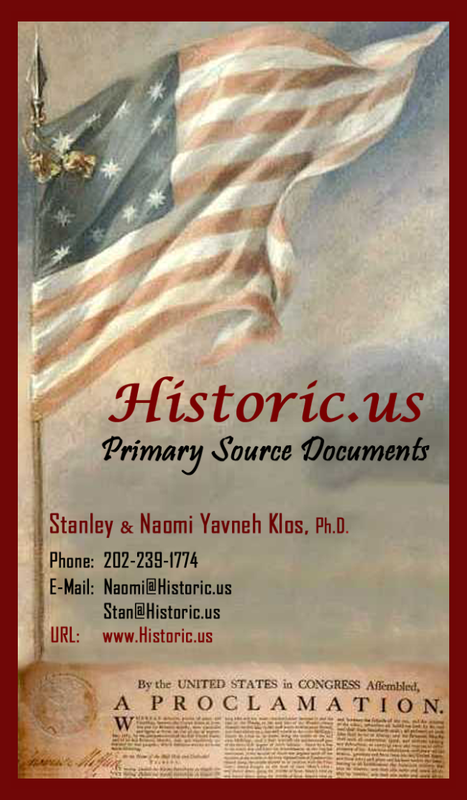 He was a signatory to the Articles of Confederation and the United States Declaration of Independence. He also served a one-year term as the President of the United States in Congress Assembled and was a United States Senator from Virginia from 1789 to 1792, serving during part of that time as the second President pro tempore of the upper house. He was a member of the Lee family, a historically influential family in Virginia politics. So far, I have not been able to connect Richard Henry Lee with The Dominion Bank in any of our published or on-file resources. I do think that the receiver of the funds is Silas Hunter, instead of Silas Huicter; the name is written a bit clearer on the right side of the note. I have also been unable to track down the identity of Silas Hunter….very frustrating. At the time, Richard Henry was busy with financial transactions with his brother William, merchant in London; Richard Henry was one of the persons in charge of loading William’s ship with tobacco consignments. Some of the consigners insisted on drawing on William before their tobacco was even transported! But this payment may not be related to his dealings with William. I’ve checked Richard Henry Lee’s correspondence in Ballagh’s two volumes, but Hunter (or the Bank) is not listed in the index. I wish you success in finding information about the bank. Sorry that I can’t be more helpful.